"[I was] very excited to see the Life Education bus at school this morning for my daughter to enjoy. At 32, I still have fond memories of sitting on the bus, looking up at the magical midnight blue sky with twinkling lights. I remember about the body and organs, and of course the giraffe as well as well as the trip myself and my classmates made on a rocket! Thank you for giving me such an amazing memory and for those you have given to other children." 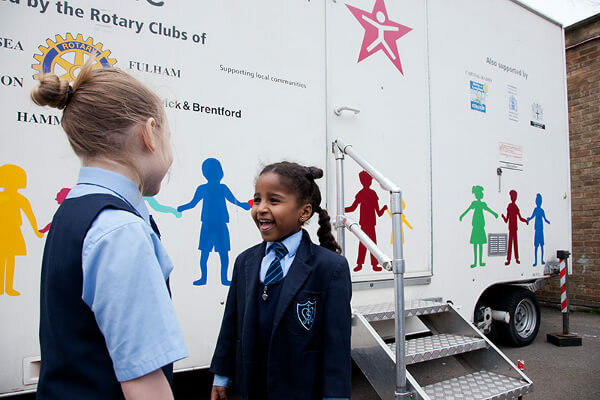 Our memorable life skills sessions are delivered in a mobile classroom driven into school grounds. Coram Life Education takes a three-strand approach addressing children’s knowledge, skills and attitudes, and our programmes are aligned with the National Curriculum (Citizenship, PSHE Education), covering all Key Stages. Take a look at our Programme Overview to find out more about what children experience in each year group. Coram Life Education has a distributed delivery structure in which 20 Delivery Partner charities and Coram Branches deliver in local areas under agreement with Coram. Coram Life Education has a presence in the South West, London & South East, West Midlands, East of England, North West, The North and Aberdeenshire. Our delivery sessions are priced between £380 and £500 per day, depending on the area and your specific needs. Contact our partner in your local area to discuss your requirements.